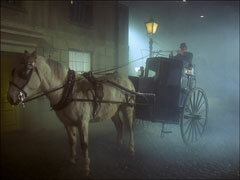 A blind man (William Lyon Brown) taps his way through a Victorian fantasy of fog-shrouded cobblestone streets. He passes a tinker (Bernard Severn) who is sharpening a sword-stick for a cloaked gentleman. A gloved hand tests the razor edge then slips the stick into a cricket bag, dropping a leaflet offering a reward for information on the Gaslight Ghoul, a murderer from 1888. A sign proclaiming "Visit Sunny Britain" is barely visible through the mist as Steed and Carstairs (Terence Brady) collect some dignitaries for a disarmament conference. Haller (Arnold Diamond) asks if a stream pipe has burst and Steed cheerfully declares that Britain still leads the world in fog (notwithstanding the second Clean Air Act). 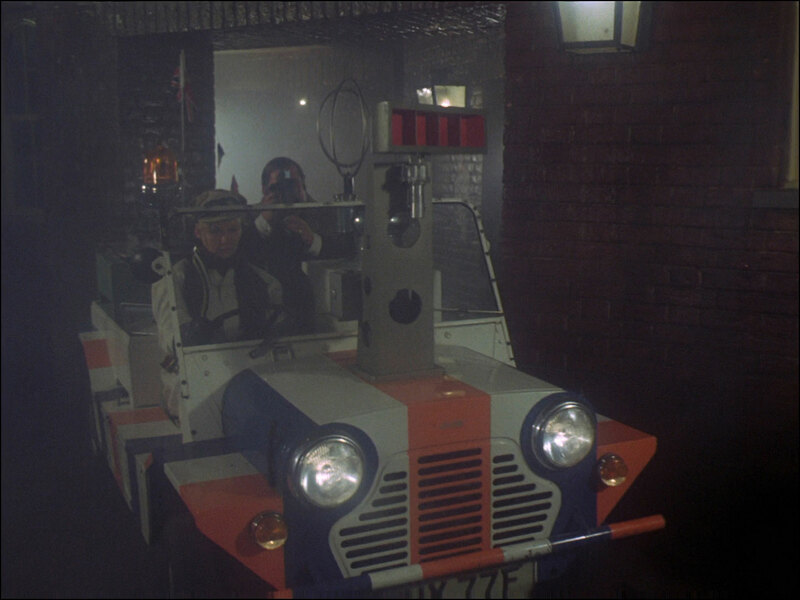 A sinister figure bearing a cricket bag watches them from the shadows... Grunner (Frederick Peisley) falls behind, stumbling in the fog, and Steed goes back to look for him after packing Haller, Valarti (John Barrard) and Straddlestoff into the limousine. Grunner is followed by a man in top hat and cloak, encountering the blind man and a lavender seller (Virginia Clay), who points him in the direction of Stable Mews. He arrives at Steed's flat where Tara lets him in but has trouble communicating with him; she realises he's one of the delegates and goes in search of Mother (Patrick Newell) who is being driven slowly through the fog by Rhonda (Rhonda Parker) in a Mini Moke fitted out with radar and flashing lights. Mother tells her Steed has gone to fetch Grunner already, but the cloaked figure calls the flat and entices Grunner outside by speaking to him in Russian, Steed missing him by seconds in the fog. 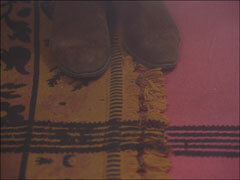 Tara hears Grunner cry out when he's killed by the sword stick and she rushes to where his body lies. She spots the sword gleaming in the darkness and strikes the hand holding it - the killer drops it and runs off into the fog. Tara is startled to hear a hansom cab depart. Tara describes the killer to Mother - tall, bearded, top hat and cape; Steed arrives and is told Grunner was found dead in Gunthorpe Street, scene of the Gaslight Ghoul murders of 1888. she leads Steed to the scene and he says the ghoul would be 150 years old at least. 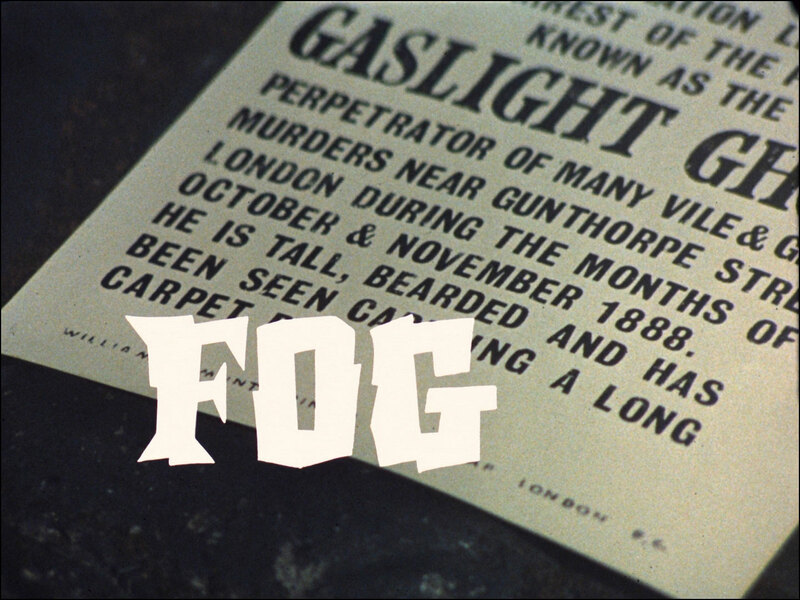 They spot a top hatted figure in the fog and go to investigate but the man runs away, leaving a cape bearing the label of a costume shop nearby. Steed goes to investigate the sword stick while Tara visits the costumier, Fowler (Norman Chappell), who tells her the cape was hired by a man named Osgood. She arrives at Osgood's the same time Steed does, the stick also linked to Osgood, but Osgood's housekeeper, Mrs Golightly (Patsy Smart), declares he hasn't been out all evening but when she lets them in, Osgood is nowhere to be found, and appears to be wearing his Ghoul outfit. 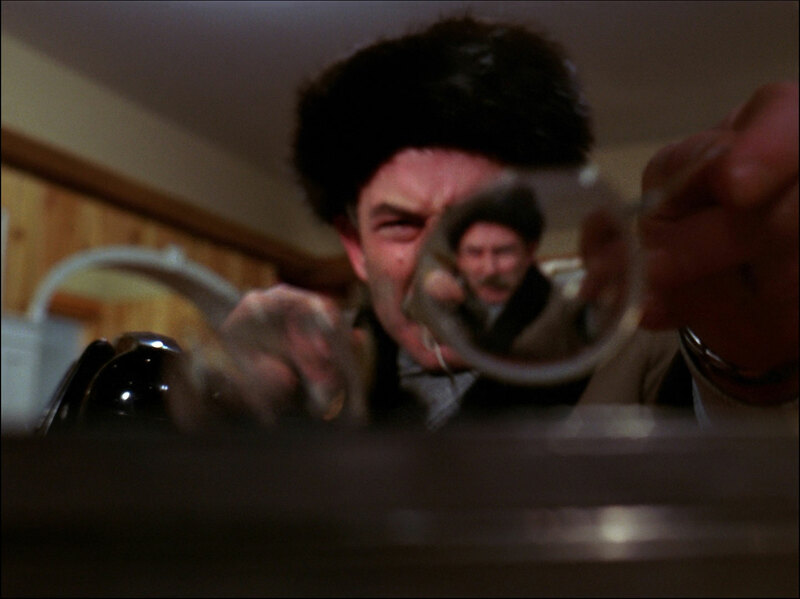 Out in the fog, the knife grinder is once more handed a sword stick to sharpen... Valarti passes an organ grinder (Stan Jay), followed by the sinister figure and moments later the grinder hears a cry. The man in the top hat drops a coin in his charity box, leaving behind the scattered pages of the disarmament committee's report. Osgood (David Bird) returns home and they discover he ran from them because he feared they were 'cutpurses' and is gratified to learn they thought him the ghoul. 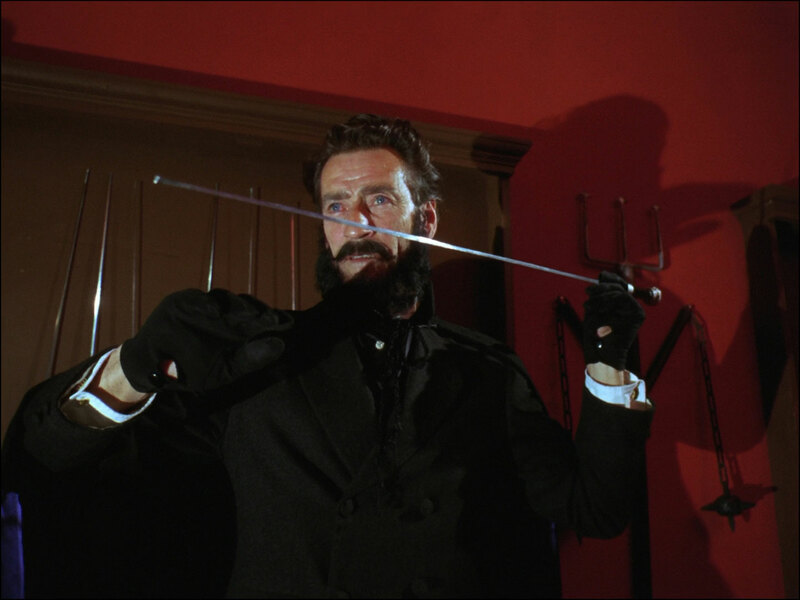 He explains he's a member of the Gaslight Ghoul Club, set up to investigate the unsolved murders and is surprised to see Steed has his sword stick, which he says is normally kept in the club's "Black Museum". Steed leaves him the stick reminding him to take more care of his possessions but as they climb into the car they hear Osgood cry out. 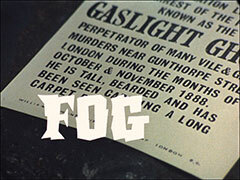 When they return, Osgood is dead and a note, "Don't interfere - The Gaslight Ghoul" is found on his person. Steed resolves to join the club with a fictitious diary kept by his Great Aunt, mother waxing lyrical as he concocts the pages describing a hitherto undiscovered Gaslight Ghoul murder. Tara goes to breaking into the club president's house while Steed goes to meet him ,armed with the diary and seeking membership of the club. The President, Sir Geoffrey Armstrong (Nigel Green), is overjoyed to find a tenth ghoul murder and welcomes him. He's introduced to Mark Travers (Guy Rolfe), club secretary and black sheep, who shows him the black museum. 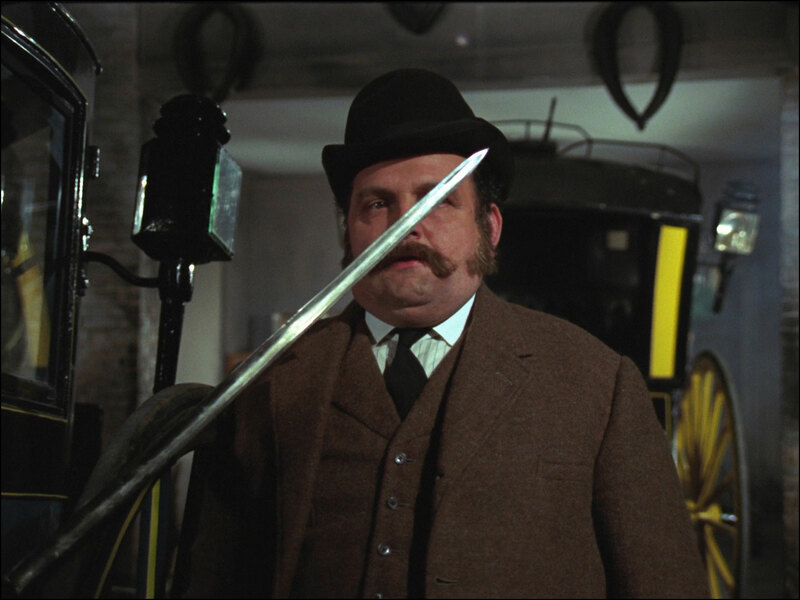 Steed mistakes the curator, Wellbeloved (John Garrie), for one of the exhibits as Travers shows him the grim collection, stopping at the sword sticks - some of which are missing. Travers asks Wellbeloved about them and declares they must have been stolen that evening. Wellbeloved dismisses this, saying Armstrong had been there at the time. They go to speak to Armstrong but he's left suddenly 0 and discovered Tara in his study, examining his scalpels. She hits him with a lamp and escapes, only to find another cloaked figure in Steed's flat - this time, it's Steed! He tells her about Valarti's death and suggests they follow up the hansom cab. Haller meanwhile is told there's no chance of a cab in the fog by the concierge (Frank Sieman) and elects to walk into the night. Steed arrives a moment later and follows after him, arriving just in time to save his life. Sanders calls Tara but he's killed before she can get there and learn what he knows. The killer tries to injure her with a cartwheel before departing to the sound of a hansom cab. Tara searches Sander's desk and turns up a receipt for four weeks' cab hire from Armstrong. 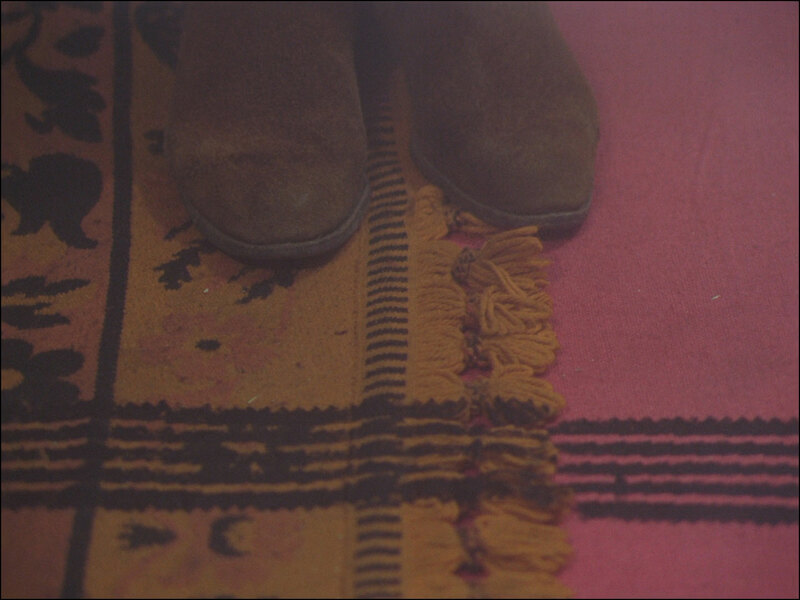 She finds a cab outside Armstrong's house and Steed is already there, thinking they're on the right track. Inside, Armstrong hears a noise... Steed and Tara see a caped figure emerge and Tara follows it while Steed enters the house and finds Armstrong has been stabbed. Armstrong tells him the assailant took the club member records, presumably to remove evidence of a motive, but there's a second set at the club house. Steed tells the dying Armstrong he already knows who did it and sets off in the hansom cab. Tara meanwhile has followed the assailant's car to the club and finds the cricket bag on the back seat. Inside it is a tape recorder loaded with a recording of a hansom cab. She enters the club and searches the museum, coming face to face with Travers. She hurls him across the room then becomes ensnared in a bear trap. Travers grabs a sword stick and menaces her, declaring he couldn't let the disarmament conference succeed - his business is armaments and it would have made him extinct as the dodo. He hears Steed arrive in the cab and tries to kill him with a sword as he enters, but Steed dives to the ground. Steed grabs a sabre and knocks away sword after thrown sword until he reaches Travers; they parry briefly until Steed gains the upper hand and sends him reeling into a coffin. Steed frees Tara and opens the curtains to reveal bright sunlight. Back at Tara's flat, the air conditioning has broken and flooded the flat with steam; through which Mother's car is driven by Rhonda!